ON THE GREEN | Although Hurricane Irene postponed both move-in day and the start of classes for the 2011-12 academic year, the storm did not dampen the enthusiasm of newly arriving students. 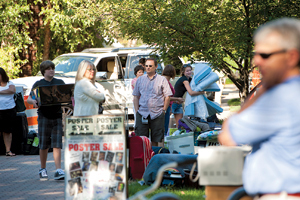 On the first weekday move-in (on Tuesday, Aug. 30, rather than the previous weekend) that most members of the UD community could remember, parents, students and Arrival Survival Team volunteers pitched in to make it as efficient as possible. “I applaud the UD community for their efforts in making this unusual opening a positive experience for our students and their families,” says Dawn Thompson, dean of students and associate vice president for student life. The delay in fully opening the campus and beginning classes forced the cancellation of New Student Convocation this year, but freshmen and other new arrivals had additional special activities to welcome them. During the first few days of the semester, for example, members of the Class of 2015 were invited to sign their class banner at Student Activities Night and at other locations. The banner has become a tradition, sponsored by the UD Alumni Association. Freshmen also were able to visit the UD Bookstore to receive their class T-shirts, which normally would have been distributed at Convocation. President Patrick Harker welcomed new students by letter this year, telling them that the Class of 2015 is the largest and most accomplished in UD history. Admissions records show an entering freshman class of 3,915 students, surpassing the previous record of 3,815 in 2009, with the highest average SAT scores (1827) and high school grade point averages (3.69) ever. The University also welcomed 1,241 new graduate students, bringing the total to 3,400 students in graduate and professional education.